Students from Godinez High School participate during the demonstration. 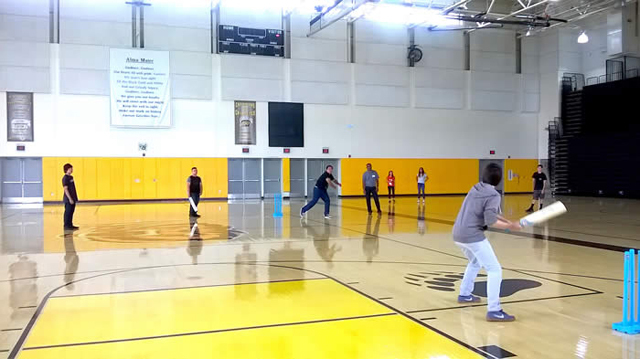 Southern California Cricket Academy (SCYCA) and the Orange County Cricket Association (OCCA) conducted a cricket demonstration at Godinez High School in Santa Ana, Orange County on September 3. The high school is located next to Centennial Regional Park, the primary cricket ground of OCCA. OCCA is excited have Godinez High School on board. The demonstration took place in the gymnasium in front of 250 students. Most of the students were sampling one of the most popular games in the world for the first time. After a brief overview of cricket in USA and international cricket, several video clips were shown while explaining the basics of cricket. After a question and answer session, volunteer students were called onto the floor to play cricket. It was seen that all players enjoyed and the spectators as well. PE teaches were involved during the demonstration and they were enthusiastic to learn about this new game to USA. Special thanks to Mrs. Sera Henderson for coordinating this event, all PE teaches for their support and SCYCA coaching staff for their commitment. For more information visit Southern California Youth Cricket Academy.